Two weeks ago I before the vacation weeks we had a Chaosweek at school where we do allot of odd things. 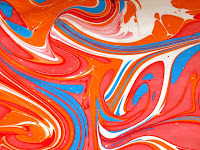 Paper marbling is an ancient art that is a bit unknown but certainly very special., you can actaully make swirl and hard to get shape with a very clean flat surface. It's most common use of this technique is actually to cover the inside of a book cover, however you can also see them as an art piece. 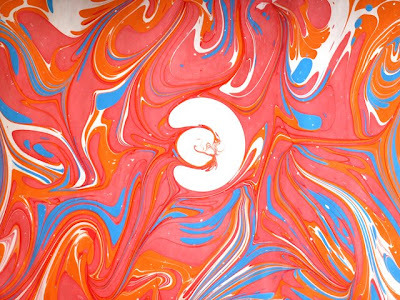 To make paper marbling you have several ways to make it actually. It all make the use of chemical reaction of two components that does not blend with each other. 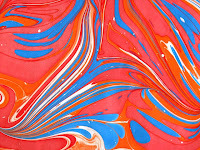 Like oil and water however the ink / paint will be absorbed by the sheets of paper. So either way you make a box filled with water and mix the paint with an oil and drop it on the water, the in will stay afloat and then you can shape the drops with a sticks or even blow the drops to take a certain shape.